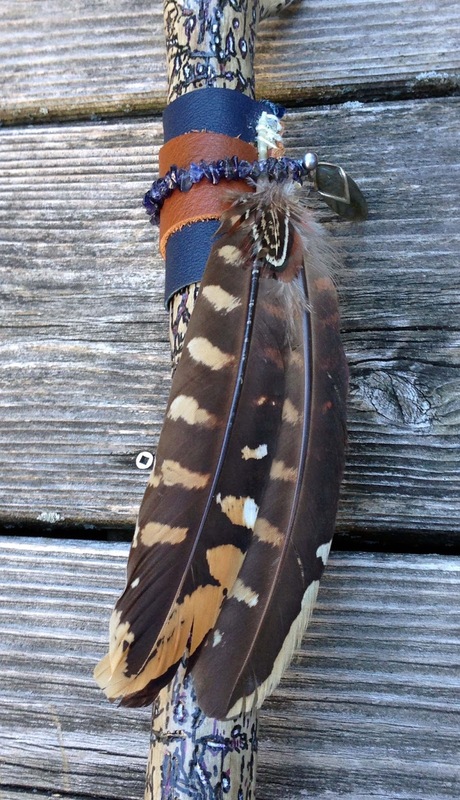 While walking with a close friend one day in Kingston Point Park this beautiful Hudson River Wormwood Wand found me; sent me messages, and asked me color its markings so others would understand and share its vibration… and the Glyphic Activation Wand it became is truly amazing. 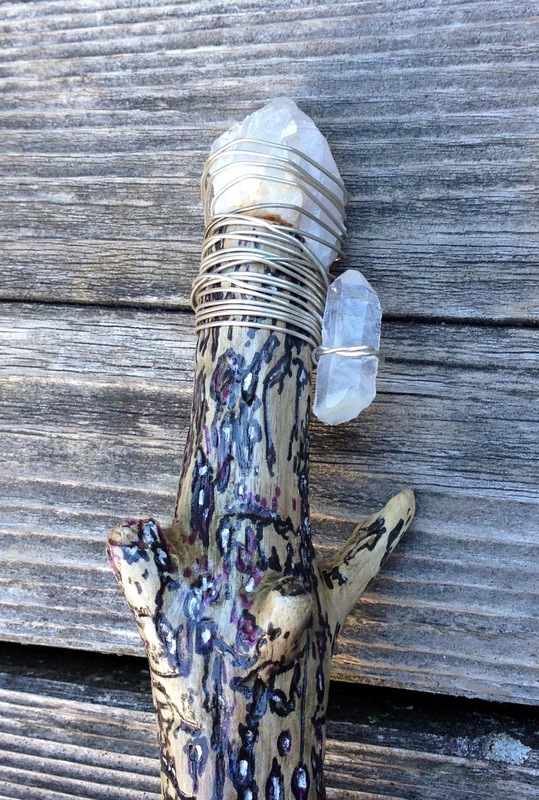 An activation wand connects all the energy channels with intention in order to activate and energetically connect the crystals within the grid. When you create a crystal grid you need to activate it and send your intentions out into the universe. A quartz crystal opens the mind and heart to higher guidance, allowing the realm of spirit to be transmitted and translated into the world of physical form. Quartz is excellent for amplifying the energies of other stones or to enhance groups of stones, and is ideal for gridding. 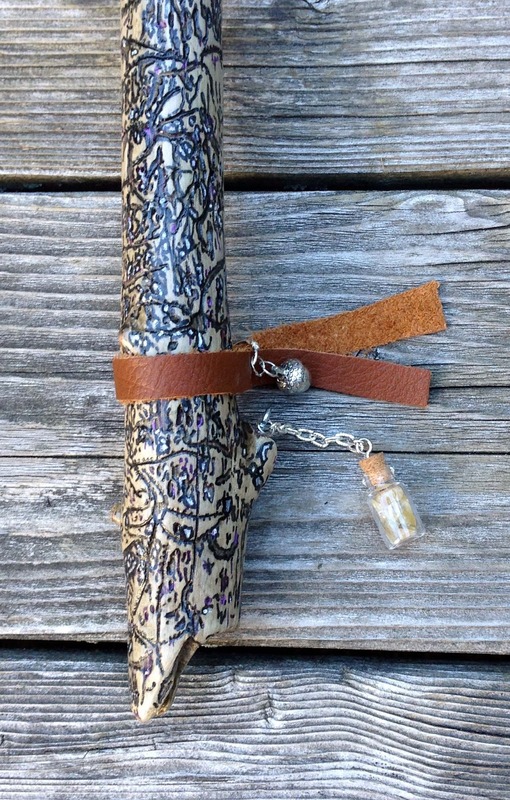 It is perfect material for wands, staffs, as it produces a force field of healing negative ions while clearing the surroundings of positive ions, protecting the aura. Citrine is a primer stone of abundance and manifestation, attracting wealth and prosperity. Warm and energizing it raises self-esteem and stimulates imagination, mental focus, and personal will. Natural Citrine does not hold or accumulate negative energy, but rather transmutes, dissipates, and grounds it, making it extremely protective for the environment. Iolite assists with activating the visionary, creative side of the mind, and accessing thoughts and ideas beyond the ordinary. Iolite resonates with the energy of twilight, a beautiful violet-blue that stimulates psychic awareness, and helps in recovering balance. Labradorite allows one's innate magical powers to surface so it’s often used to bring about change. It enhances mental and intuitive abilities, assists in communication, and attracts strength and perseverance. It is, in every sense, a Stone of Magic, a crystal for scrying, healers, shamans and all who travel and embrace the universe seeking knowledge. Throughout the world silver is identified with the lunar manifestations of Mother Earth. Because it is found in its pure form it is one of the first metals to be used by humans. Silver is psychic influencing, and when worn it stimulates psychic awareness while calming the conscious mind. As the moon reflects the light of the sun, so does this metal reflect negativity away from its wearer. Discover some useful plants that can support healthy garden crops; and then provide food and health for your home. Companion planting is often done planting flowers among vegetables in a garden; they add beauty and benefits such as repelling insects and pests. Companion planting is important for understanding how plants work, which insects and pests are repelled, and which beneficial predators are attracted. In the plant world what we see is only a portion of what is going on beneath the soil, once we understand this there is another aspect of companion planting we can harness. Beneath the soil plants trade nutrients and phytochemicals (plant chemicals we use for medicinals). 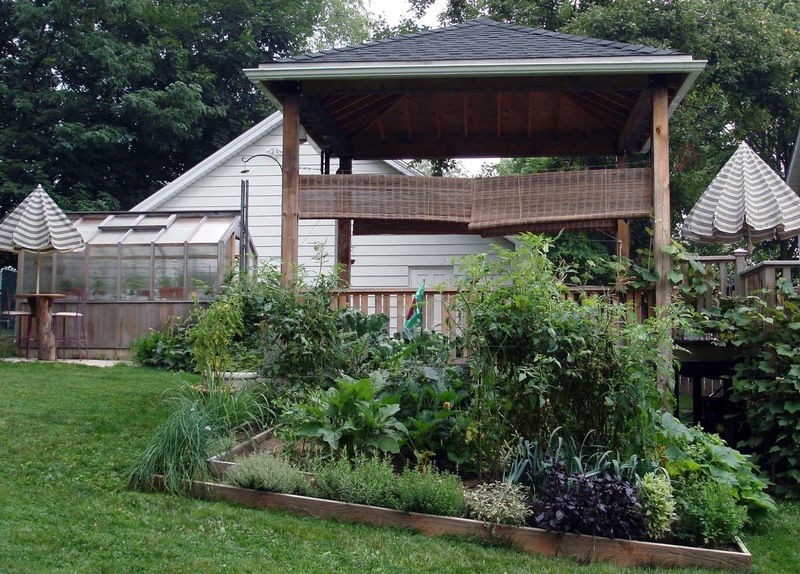 This relationship harnessed in permaculture is a garden design technique that makes use of the many complex and symbolic relationships among plants, insects, and animals. Making use of all aspects of companion planting give us the most vibrant and productive plants and soils. Why not try planting mutually beneficial crops together and give them equal attention in our gardens, kitchens, and medicine cabinet. Below are examples of good companion choices. 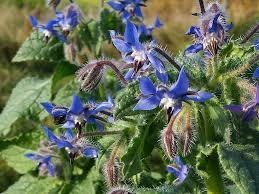 In the garden borage is a favorite companion for strawberries, squash, and tomatoes. An annual that self seeds and is said to strengthen nearby plants, as they tend to concentrate trace minerals in the soil. In the kitchen the leaves of borage taste a bit like cucumber and are wonderful in salad, although some people don’t like their slightly prickly texture. You can also make a spread for veggies or bread by chopping the leaves finely and combining them with a soft cheese. In the medicine cabinet borage is the highest known plant source of gamma linolenic acid, an omega-6 fatty acid that is believed to be anti-inflammatory. The leaves are said to lift the spirits and support the health of our endocrine systems. In the garden this member of the bean family fixes nodules of nitrogen around its roots, increasing the soil fertility. Red clover is especially helpful at making the soil less compacted, and less acidic. In the kitchen red clover can be enjoyed raw as an addition to vegetables and salads; this may bring back memories of sitting in a field sipping wild clovers sweet nectar, and you are really doing your body a favor red clover is a source of many nutrients including calcium, chromium, magnesium, potassium, and vitamin c. For an adult treat through a handful of the red flowerets plucked from the flower head into warm rice with a pat of butter, and you’ll be delighted! 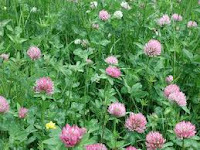 In the medicine cabinet the red clover flower is rich in minerals and vitamins, and is a well known blood thinner which can help prevent blood clots. It’s often used as a tea to improve the condition of our kidneys and liver. 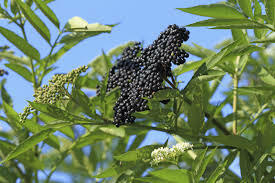 In the garden the soil underneath your elderberry will become much more aerated, and it also tends to work as a compost activator assisting in breaking down kitchen and yard refuge. The leaves can be made into a tea and sprayed to control aphids. In the kitchen elderberries are the current foodie hot crop; the main stream has finally caught on to how delicious the berries are in jams, jellies, syrups, wines, and more. They are a bit of work to harvest, making prices climb, but they are incomparably delicious! In the medicine cabinet the elder plant is one of the most sought after plants for cold and flu season, as it is known to combat 8 various strains of the influenza virus. The berries are used for this purpose; often tinctured, and is so delicious it’s better in teas and syrups. In the garden garlic is your superstar if you have fruit trees or roses, as it is repellant to aphids, borers, codling moths, root maggots, snails, and even deer. A mix of garlic oil diluted with water is an effective spray to repel aphids, fungus gnats, and whiteflies; and can also be helpful to deter brown rot in stone fruits, and late blight in potatoes and tomatoes. In the kitchen garlic makes a flavorful, healthy and savory addition to every meal, and there are unlimited ways to use it, fresh, roasted, oil infused. Try oven roasting whole heads of garlic; remove the excess outer skin, and trim off the head just to expose the cloves, drizzle with olive oil and place in a 300 degree oven until soft and brown, then squeeze out the garlic paste to make any dish more flavorful. In the medicine cabinet fresh garlic is one of the worlds superfoods, its antibacterial, antifungal, antioxidant, and anticarcinogenic, and antiviral properties. Garlic stimulates the immune system; and is used to fight high blood pressure, colds, earaches, flus, and intestinal bugs, soar throats, and even helps ward off cancer. Eating garlic raw is the best way to use it for stimulating your immune system. In the garden leaves of yarrow are used in biodynamic agriculture as a compost activator. It also helps draw beneficial insects to your garden. And when planted close to your favorite plants it increases their aromatics. 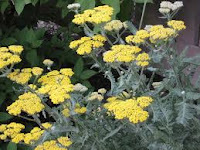 In the kitchen yarrow is similar to tarragon and can be used where tarragon is called for. 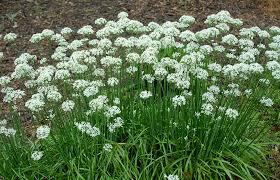 You might also mix it with other delicately flavored herbs such as tarragon, chervil, and parsley. In the medicine cabinet yarrow is an anti-inflammatory and a styptic (stops bleeding). It’s commonly used for first aid of minor cuts and scrapes to reduce bleeding and for its antibacterial properties. Your home should be a safe and peaceful space that promotes well being and health. However, if you’re constantly cleaning up the house with harsh chemicals, washing it down with anti-bacterial soaps, and steeping yourself in off-gassing bedding, carpet and décor, your home may not be such a safe place after all. Keep toxins out of the house? Don’t bring them in in the first place. Remove your shoes at the door and track less dirt, chemicals, lead, oil, and pesticide residues into the house. It’s also a nice way to leave the world behind, and then symbolically welcome yourself back to the haven of home. Most of us drink, shower, and bathe with water that’s full of highly toxic chemicals such as arsenic, fluoride and, chlorine. To get rid of them filter your drinking water and install a filter in the shower, or a whole house filtration system to remove up to 99% of the chemicals. Commercial household cleaning products are a significant source of toxins, polluting your indoor air, and contaminating your body, as they’re absorbed through the skin while you scrub. Cut your exposure by making your own inexpensive, non-toxic cleaning products, using baking soda, Castile soap, lemon juice, tea tree oil, vinegar, and other natural products. Stay away from toxic toothpaste. Most toothpastes and mouthwashes are loaded with fluoride, triclosan, artificial flavors and colors, all of which are terrible for your body. Switch to natural versions from the health food store or better yet, make your own. Don’t buy body care products containing parabens, sodium lauryl sulfate or oxybenzone. They’re just a few of the toxins lurking in common body care products with the power to throw your hormones off cycle and trigger health problems. Synthetic bedding and wall-to-wall carpeting are made from petrochemicals and are often treated with chemical flame-retardants, and nobody should spend 8 hours a night steeping in all that! Switch to unbleached, organic cotton, linen, wool or down alternatives for your bedding, and trade synthetic wall-to-wall carpet for eco-friendly, sustainable materials like bamboo floor coverings, and organic sisal.